2000 or more persons in attendance at weekly worship, counting adults and children at all worship locations. All megachurches are not identical and do not always resemble the nontraditional and seeker-friendly style of a church like Willow Creek Community Church. However, their very large numbers of attendees does shape their functioning in distinctive and often uniform ways. Our latest research report highlights many of these characteristics. 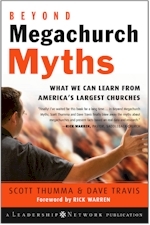 If you are interested in megachurches, you might find this book co-authored by Hartford Institute professor Scott Thumma, interesting and informative.